(Framingham, Mass. – October 24, 2011) We’re pleased to announce that David Karofsky, President of Transition Consulting Group, has been awarded certificates in Family Business Advising and Family Wealth Advising by the Family Firm Institute (FFI). These certificates are presented to individuals who have achieved comprehensive professional knowledge and gained significant expertise that can be used as value to family business owners and family wealth clients. This distinction further ensures that the highest standards in professional best practices will be implemented. 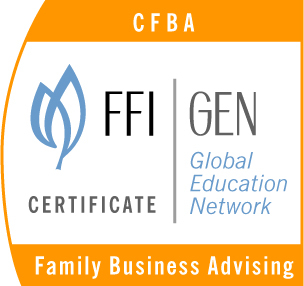 The FFI’s Family Business Advising and Family Wealth Advising Certificates are designed to increase awareness and exposure to concepts, skills and knowledge necessary to optimize effectiveness as family business advisors and consultants. “Through completion of both certificate programs, David Karofsky has gained a deeper understanding of the needs of family-owned enterprises and the many roles family business and non-family members play, “ said Judy Green, Executive Director of the Family Firm Institute. Participants have access to cutting edge information and resources for exploring the core disciplines — behavioral science, finance, law and management science — and steps for forming collaborative teams. FFI provides multidisciplinary educational programs to advance family enterprises worldwide by enabling collaboration between family enterprise practitioners and academics, creating a global network of professionals. 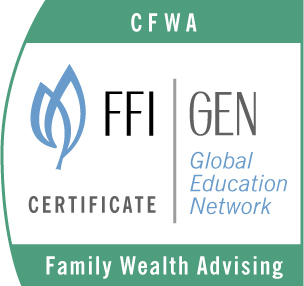 The Family Firm Institute (www.ffi.org), an international professional membership organization of over 1500 individuals and organizations across 50 countries, is dedicated to providing interdisciplinary education and networking opportunities for family business and family wealth advisors, consultants, educators and researchers. It works to increase public awareness and broaden the understanding of trends and developments in the family business and family wealth fields. As the dominant form of business organization worldwide, family businesses make a unique contribution to the social vitality and economic wealth of communities. FFI seeks to increase the understanding of the family enterprise as a fundamental driver of global economic growth and prosperity.